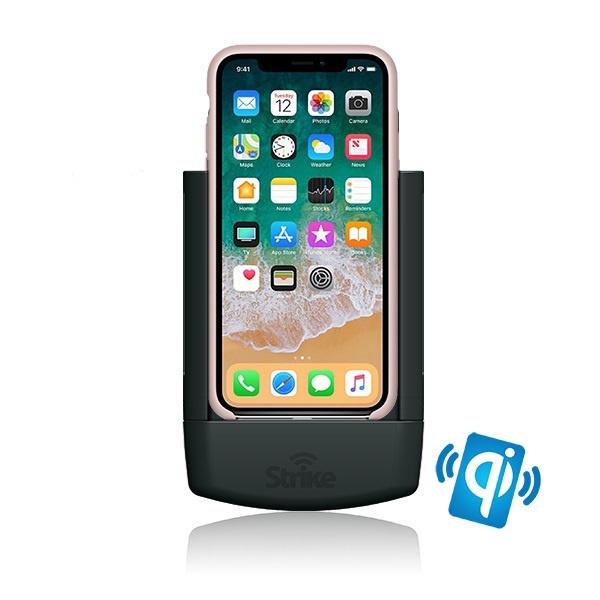 Strike Alpha Cradle for Apple iPhone X with secure charging, antenna connection and pass through connector included. The connector cable used in this cradle is an authorised MADE FOR IPHONE Apple lightning cable. Packaged for a professional installation through your installer. Strike Alpha Cradle for Apple iPhone X DIY with secure charging, antenna connection and pass through connector included. The connector cable used in this cradle is an authorised MADE FOR IPHONE Apple lightning cable. DIY packaging for an easy Do It Yourself installation. 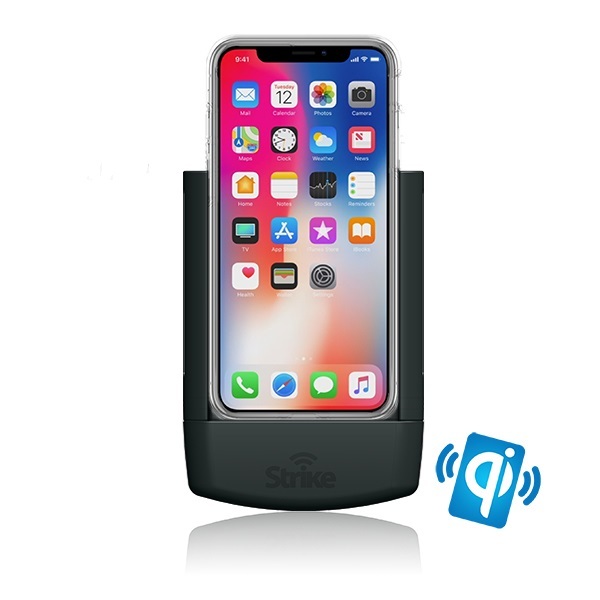 Strike Alpha Apple iPhone X Car Cradle with fast wireless charging capability and antenna connection. Packaged for a professional installation through your installer. 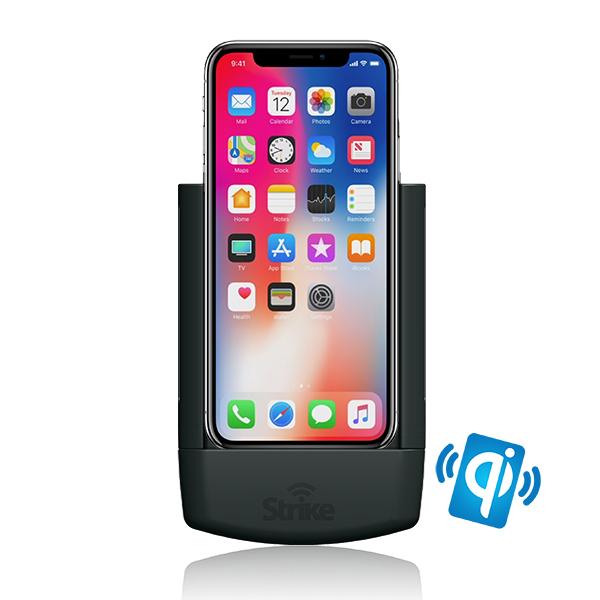 Strike Alpha Apple iPhone X Car Cradle with fast wireless charging capability and antenna connection. Packaged for a Do-It-Yourself installation. Strike Alpha Apple iPhone X for use with your Official Apple Leather and Silicon Cases - the only cradle that can be used with your iPhone case still on! Secure charging, antenna Connection and pass through connector included. The connector cable used in this cradle is an authorised MADE FOR IPHONE Apple lightning cable. Packaged for a professional installation through your installer. The Strike Alpha iPhone X cradle - the only cradle that can be used with your iPhone case still on! Secure charging, antenna Connection and pass through connector included. The connector cable used in this cradle is an authorised MADE FOR IPHONE Apple lightning cable. DIY packaging for an easy Do It Yourself installation. Strike Alpha Apple iPhone X Car Cradle for use with your Official Apple Leather and Silicon Cases - the only cradle that can be used with your iPhone case still on! With fast wireless charging capability and antenna connection. Packaged for a professional installation through your installer. 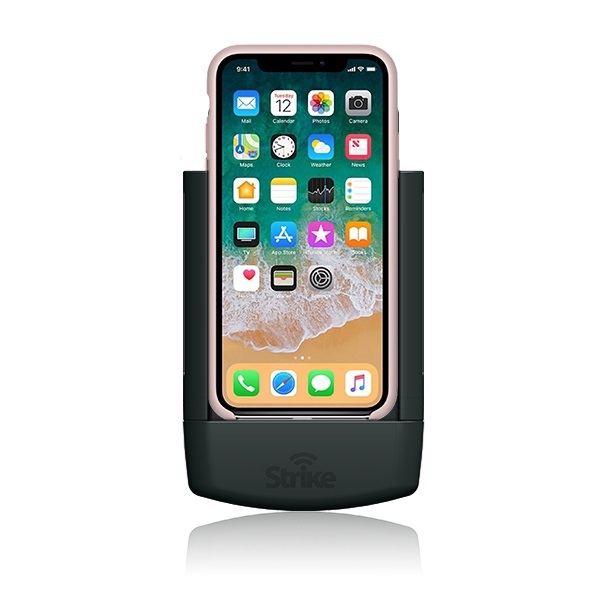 Strike Alpha Apple iPhone X Car Cradle for use with your Official Apple Leather and Silicon Cases - the only cradle that can be used with your iPhone case still on! With fast wireless charging capability and antenna connection. Packaged for a Do-It-Yourself installation. 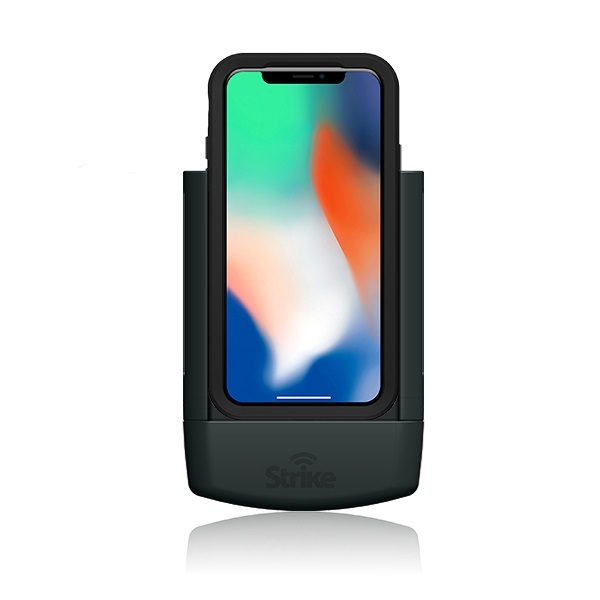 Strike Alpha Cradle for Apple iPhone X with Strike case - the only cradle that can be used with your iPhone X Strike case still on! Secure charging, antenna connection and pass through connector included. The connector cable used in this cradle is an authorised MADE FOR IPHONE Apple lightning cable. Packaged for a professional installation through your installer. Strike Alpha Cradle for Apple iPhone X - the only cradle that can be used with your iPhone case still on! Secure charging, antenna Connection and pass through connector included. The connector cable used in this cradle is an authorised MADE FOR IPHONE Apple lightning cable. DIY packaging for an easy Do It Yourself installation. Strike Alpha Apple iPhone X Car Cradle for use with your Strike Clear Cases - the only cradle that can be used with your case still on! With fast wireless charging capability and antenna connection. Packaged for a professional installation through your installer. 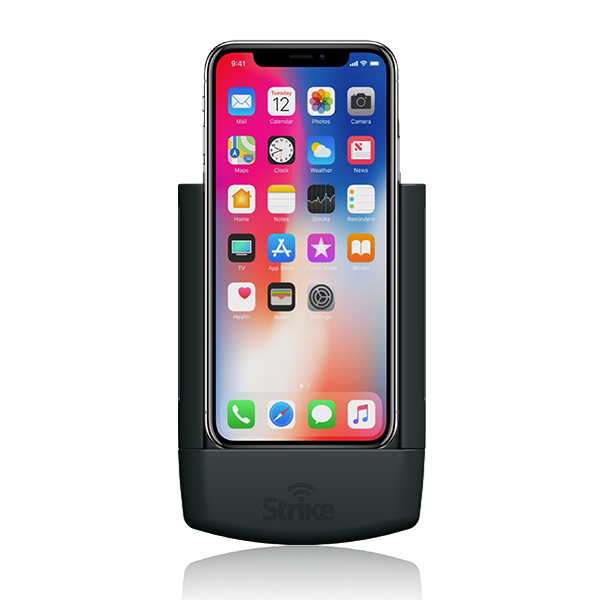 Strike Alpha Apple iPhone X Car Cradle for use with your Strike Clear Case - the only cradle that can be used with your case still on! With fast wireless charging capability and antenna connection. Packaged for a Do-It-Yourself installation. Strike Alpha Cradle for Apple iPhone X - the only cradle that can be used with your Strike Rugged case still on! Secure charging, antenna connection and pass through connector included. The connector cable used in this cradle is an authorised MADE FOR IPHONE Apple lightning cable.Packaged for a professional installation through your installer. 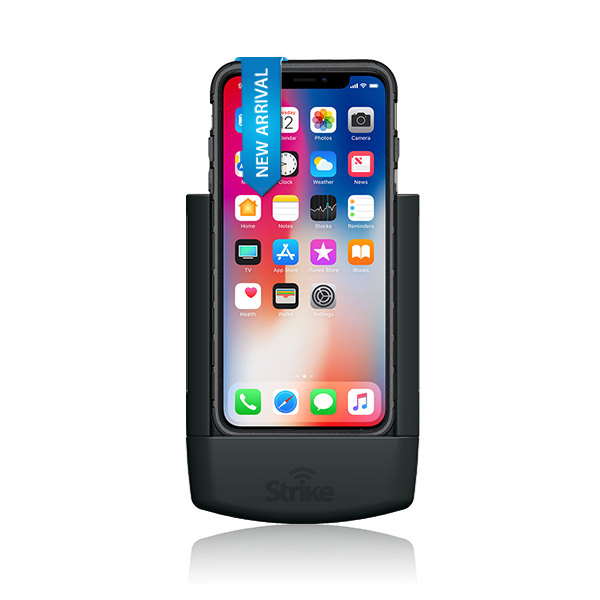 Strike Alpha Cradle for Apple iPhone X - the only cradle that can be used with your Strike Rugged case still on! Secure charging, antenna connection and pass through connector included. The connector cable used in this cradle is an authorised MADE FOR IPHONE Apple lightning cable. Packaged for a Do-It-Yourself installation. Strike Alpha Apple iPhone X Car Cradle for use with your Strike Rugged Cases - the only cradle that can be used with your case still on! With fast wireless charging capability and antenna connection. Packaged for a professional installation through your installer. Strike Alpha Apple iPhone X Car Cradle for use with your Strike Rugged Case - the only cradle that can be used with your case still on! With fast wireless charging capability and antenna connection. Packaged for a Do-It-Yourself installation. Strike Alpha Cradle for Apple iPhone X - the only cradle that can be used with your LifeProof Fre or Nuud case still on! Secure charging, antenna connection and pass through connector included. The connector cable used in this cradle is an authorised MADE FOR IPHONE Apple lightning cable.Packaged for a professional installation through your installer. Strike Alpha Apple iPhone X Car Cradle for use with your Lifeproof Fre or Nuud Case - the only cradle that can be used with your case still on! With fast wireless charging capability and antenna connection. Packaged for a professional installation through your installer. Strike Alpha Apple iPhone X Car Cradle for use with your Lifeproof Fre or Nuud Case - the only cradle that can be used with your case still on! With fast wireless charging capability and antenna connection. Packaged for a Do-It-Yourself installation. Strike Alpha Cradle for Apple iPhone X - the only cradle that can be used with your iPhone Otterbox-Defender case still on! Secure charging, antenna connection and pass through connector included. The connector cable used in this cradle is an authorised MADE FOR IPHONE Apple lightning cable. Packaged for a professional installation through your installer. 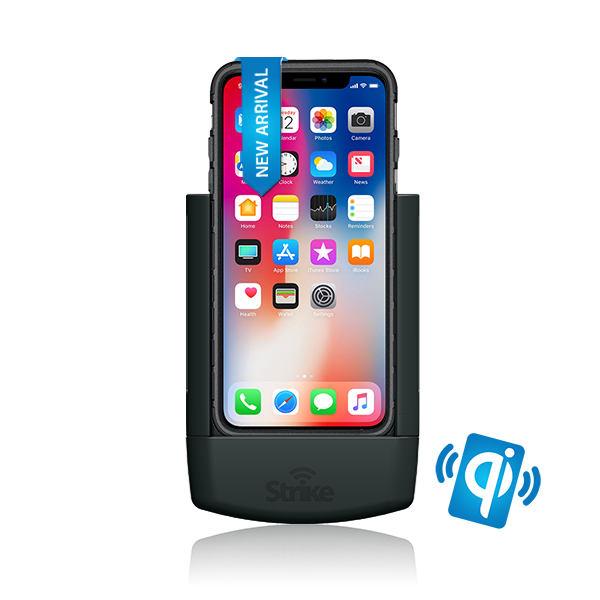 Strike Alpha Cradle for Apple iPhone X - the only cradle that can be used with your iPhone Otterbox Defender case still on! Secure charging, antenna connection and pass through connector included. The connector cable used in this cradle is an authorised MADE FOR IPHONE Apple lightning cable. DIY packaging for an easy Do It Yourself installation. Strike Alpha Apple iPhone X Car Cradle for use with your Otterbox Defender Case - the only cradle that can be used with your case still on! With fast wireless charging capability and antenna connection. Packaged for a professional installation through your installer. 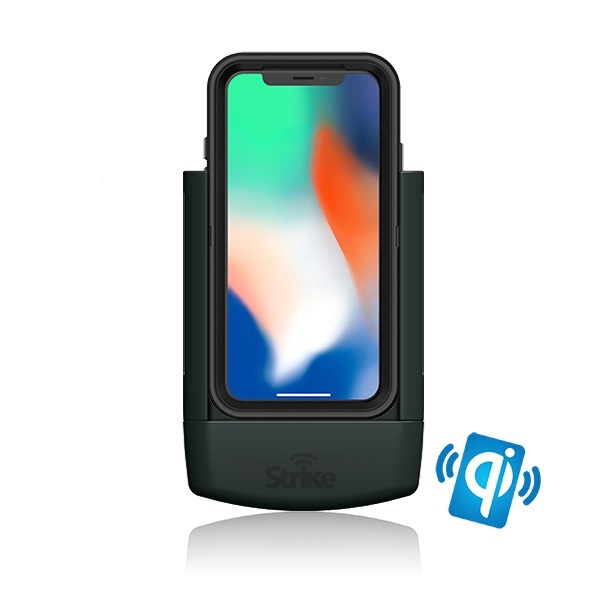 Strike Alpha Apple iPhone X Car Cradle for use with your Otterbox Defender Case - the only cradle that can be used with your case still on! With fast wireless charging capability and antenna connection. Packaged for a Do-It-Yourself installation. We are proud to announce our latest addition to our incredible range of Strike Alpha Car mobile phone holders: the world’s first iPhone X Car phone holders! The Strike Alpha iPhone X Car holder is specifically designed and manufactured to hold, charge, and protect your Apple flagship iPhone X while you’re driving. The Strike Alpha iPhone X holder has an internal passive antenna incorporated into the system to improve and boost your smartphone’s mobile signal once it is coupled with a reputable external antenna. The cradle comes with a FME male connector, which allows it to connect with an external antenna. The Strike Alpha iPhone X Car Cradle provide users with an improved smartphone experience whilst driving. Once the handset is docked onto the Alpha Cradle, the cradle will automatically charge your iPhone, prolonging battery life. Also, users can access different applications and make phone calls to anyone while mounted on an Apple iPhone X car phone holder. Additionally, the mobile phone holder features a 12/24 volt charging system, which provides added security for the users. The car mounts from Strike are pass-through compatible, which means you can integrate your mounted iPhone X with your Bluetooth car kit, entertainment system, or even your favorite computer seamlessly! With this capability, you can freely use your mobile phone anytime, anywhere. The Strike Alpha iPhone X Car Mounts come in two versions – Pro Installed and DIY. The cradles also come in a secure wireless charging versions. Package contents differ depending on what you prefer. Furthermore, our latest line of Strike Alpha Apple iPhone X Car Cradle has been designed to allow your iPhone X to be transformed into a dash cam. This will enable you to record your drive from your windscreen! Our range of new iPhone X car mounts/Alpha Car Cradles are available on this page. Feel free to click through to help you decide which phone holder will be perfect for you and your new high-end smart device.